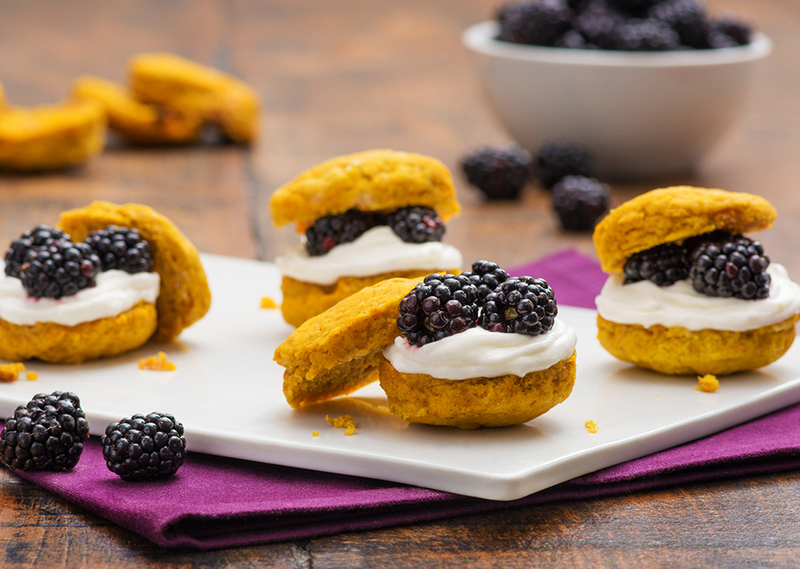 If you like, prepare the biscuits ahead of time and grill quickly before serving so they'll be warm and tender – just right for fluffy whipped cream and fresh berries. Place deep dish baking pan plates on the grill. Use switch at bottom right rear of grill to make flat surface. Close cover; set cooking temperature at 400°F and cooking time for 12 minutes. Allow grill to preheat for 5 minutes. In a large bowl, stir together flour, brown sugar, baking powder, pumpkin spice blend, baking soda and salt. Cut in butter until it resembles coarse crumbs. In a separate bowl, stir pumpkin with buttermilk; stir into flour mixture just until moistened. Toss together blackberries, sugar and lemon juice; let stand for 10 minutes. Meanwhile, beat cream with maple syrup using an electric mixer on high until it holds soft peaks. Halve biscuits; place bottom half of each biscuit on a dessert plate. Top with blackberries and whipped cream; cap with biscuit top. Serve immediately.